The Classics Novels is a unique needlepoint canvas from Alice Peterson AP2891. 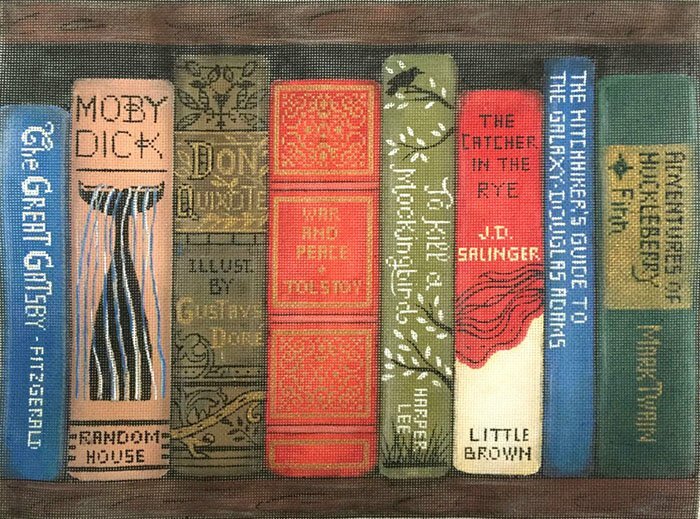 It features book spines lined up on a shelf of famous novels throughout history. The design area measures 14.5" x 10.75". The design is handpainted onto 18 mesh mono needlepoint canvas so you can stitch in all this lovely detail. Can be purchased with or without fibers. If you select cotton we will send DMC cotton floss. For wool we use Bella Lusso Italian merino threads, and silk we will send Planet Earth Pepperpot fibers which are single-ply for 18 mesh and easy to stitch with. If you want stretcher bars to hold your canvas taut while you stitch it (optional) we recommend a pair of 18" and a pair of 14" and some thumb tacks. For shipping costs and information see our shipping policy. Please contact us with any questions about this or any of our other needlepoint designs. We are always happy to help. You can email us or call us on 877 722 8463.